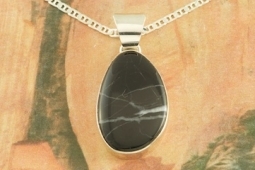 Beautiful Pendant featuring Genuine White Lightning set in Sterling Silver. Free 18" Sterling Silver Chain. White Lightning Stones are a stunning new discovery from the hills of Tonopah, Nevada. Created by Navajo Artist Wilson Padilla. Signed by the artist.